This semester began much like fall of 2017–with me landing on my rear. Literally. There’s just something about that first day back to school that makes me miss my step, aparently. Or maybe it has something to do with fuzzy socks on a carpeted staircase at dark-thirty in the morning. At least I wear shoes to go down my stairs now. At any rate, once I’ve picked myself up off of the floor at the bottom of the staircase and limped into the kitchen to make coffee, our day moves along fairly smoothly: from quiet time for the parents, to breakfast and Proverbs as a family, then to chores and personal Bible time for the kiddos (while Mama gets her homeschool game face on). My boys have enjoyed listening to The Jesus Storybook Bible and the free dramatized audio bible available from Faith Comes by Hearing. In the past few months, C-age-8 has begun to read about a chapter a day from the New Testament in his own bible, so the transition from bible listening to bible reading is going pretty smoothly so far! Then there’s this lovely thing called Morning Time. A dear local mommy friend who’s a little further down the road of motherhood than I am turned me onto this idea several years ago. I latched on to this idea and went searching the interwebs, eventually finding further inspiration from Pam Barnhill’s Your Morning Basket podcast and resources (and she has a new book available on the topic if you’re interested!). That groundwork having been laid and tested over the past couple of years, we usually start out our school day with lighting a candle, going over our calendar and plans for the day, prayer, singing a hymn, reciting from our memory work binder, poetry reading, and currently reading aloud from Story of the World Volume 2 and a children’s adaptation of Pilgrim’s Progress. This week, I’ve also re-attached our Preschool Prodigies Music lessons as well as 5-10 minutes of Spanish to our Morning Time routine. I tried to shorten Morning Time by moving these things to the afternoon, but found that they simply didn’t get done! Confession: there have been many days in the past quarter that I have skipped Morning Time to dive right into math because we were just short on time, but I have been finding lately that when life has gotten heavy and my energy reserves are running thin, starting the day with Morning Time ministers to my soul, helping me to take a deep breath, enjoy the time with my kids, and humbly move forward with my heart more focused on the Lord. Turns out biblical truth and delightful learning are a great way to start the day. Moving on to math, D-age-6 finished Right Start Math Level B in February and has moved on to Level C after a well-earned week of playing math games. My older son, C-age-8, is half way through Level D, currently working on mastering multiplication facts and applying them to solving area problems. As for me, I’m learning to read ahead in our math books and plan our lessons accordingly. This subject has been the hardest for me to keep to short lessons. Partly because my kids just take longer than expected, and partly because the lessons sometimes require two days rather than the one day suggested by the book (or more realistically speaking, the one day expected by their mother). I started out last semester working with a timer, keeping our math lessons to 20-30 minutes. That worked well until I stopped using the timer (oops). This quarter, I still haven’t been using the timer so much, but I am learning to repent of the pride that drives me to want to push my kids further and faster. I’m teaching my kids, not a lesson. This is not a race. Our math curriculum itself is built upon understanding and enjoying math, not racing through to the next thing. Embrace the time it takes to grow. When I keep things in perspective, it’s a lot easier to see how much work is reasonable for a given day (it’s a lot less than what I used to think!). For language arts, we’re continuing to work through First Language Lessons levels 1 and 2. My oldest could have been into level 3 by now, but I wasn’t sure what I wanted to do after level 1, so we stalled out for a year. That means his brother is only one book behind him. Oh, well! They’re both learning and enjoying their lessons on basic grammar, poetry, story and art narration, copywork, and dictation for my oldest now in level 2. I love that this curriculum has been a gentle introduction for me to these classical methods of teaching. We also have enjoyed these free copywork resources from Simply Charlotte Mason this quarter. They include scripture, poems, and hymns. Overlapping a bit of reading and language arts, C-age-8 reads aloud to me from McGuffey’s second reader about once a week, narrates the story to me, and then says and spells the words listed at the end of the lesson. D-age-6 is reading aloud to me almost daily from McGuffey’s pictorial primer in order to continue progressively practicing his budding reading skills (we used Teach Your Child to Read in 100 Easy Lessons to start the process). I use these readers because they’re progressive, they use older English so that we’re starting out in the direction of classic literature, and because they were hand-me-downs (read: free). Any further discussion of reading blends into everything else we’re learning: history, literature, nature/science. C-age-8 has recently finished The Tale of Desperaux, The Secret Garden (with some guided discussion on the ideologies presented), Old Yeller, Where the Red Fern Grows, The Great Brain, Julie of the Wolves, The Little Prince, Because of Winn Dixie, and The Burgess Animal Book, among most of the books in the Boxcar Children series (these are free reads). I can hardly keep up for record-keeping purposes! Nathaniel decided to give him a more challenging read to slow things down a bit: G. A. Henty’s For the Temple, historical fiction covering the Roman sacking of the Jerusalem temple in 70 AD. We just covered this event and the diaspora in Story of the World, so he’s got some points of connection with it already. He’s also reading a chapter a day in Seabird by Holling C. Holling for geography and natural history. I ask for him to narrate, or tell back in his own words, what he has read on days when I’m paying attention. Admittedly, there have been several days (weeks perhaps?) in the past quarter that I have been too busy to ask for a narration for every bit of school reading! D-age-6 has recently enjoyed moving from Frog and Toad readers to The Boxcar Children and Amelia Bedelia books. 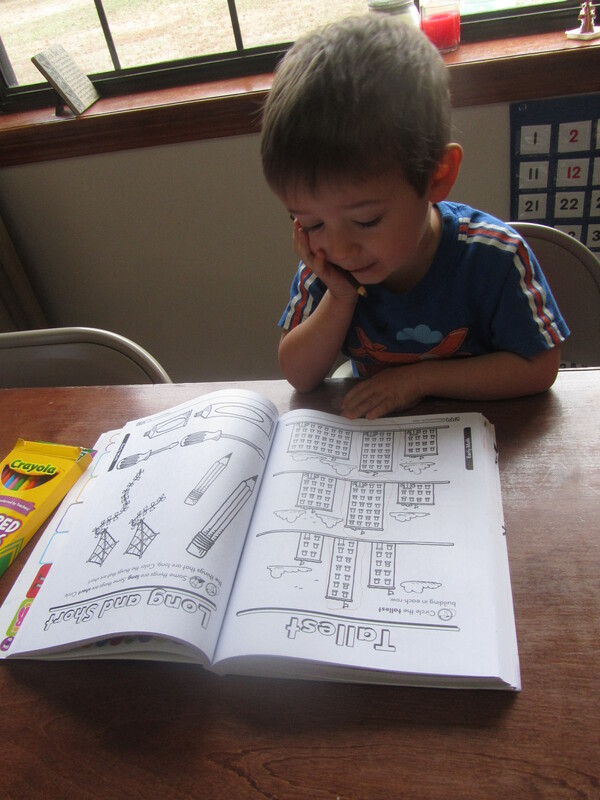 He’s enjoying reading more fluently for himself, but soon I think he’ll be ready for more assigned books. I think Whinnie the Pooh is in order next. We’ve read it aloud many times over, so I think he’ll be delighted to read it for himself! This section could be a post all its own, so I’ll try to let pictures do most of the talking with a few extra words here and there for things not pictured. We enjoyed a Little House book club party with a local Charlotte Mason group. Exploring historic Ft. Smith after mama read True Grit. We took in a stray German Shepherd dog that followed me home last fall–right after the 500th anniversary of Luther posting of his 95 theses, so naturally we named him Luther. C-age-8 had almost full responsibility for feeding him each day. There was plenty of character development in caring for a dog, and even more when we decided he needed a family who could care for him even better. It was hard to let go of Luther since he had been a part of our family for three months and had in that time doubled in size and made it through the coldest winter we’ve had in years. It was hard to let go, but we all learned a lot and are thankful for the part we had to play as a doggy foster family. Hiking in 20 degree weather to see this 95 foot waterfall when it was mostly frozen. Petit Jean State Park. Bird poster and Calendar of Firsts helping us to learn to pay attention and take note! Gardening, listening to classical music, watching the ants in our ant farm. Our four-day backpacking trip on a 24-mile section of the Ouachita Trail in the Winding Stair Mountains of eastern Oklahoma. Field trips to animal shelters and to learn about hippotherapy (that’s with horses). Ice and roller skating and get-togethers with our Schole Sisters group–watercolors, poetry and tea, fish feeding and nature walk. The past two months have been a bit crazy. There were many times I said to my husband, “I just don’t think we can do school next week with all we have going on.” He gently encouraged me to try. And we did. We kept going through sickness (though we did take a week off when it was really bad), a job change and consequent change of insurance and all other such things, two grandmothers in the hospital, a car wreck, among other things. I think I would have given up somewhere along the way, so I’m thankful for my husband’s gentle encouragement to just keep going. Like I said above, our scripture and praise-filled Morning Times were a balm to my soul during a such a hectic season. I suppose in terms of the average school year, we should be wrapping things up in about two months. We plan to keep going with our current routine, and we’ve got some fun activities planned with our homeschool group, including Field Day which my husband and I coordinate. Should be a fun spring! How about you? What’s up in your homeschool world? My husband and I each knew we’d homeschool our kids before we ever met and married. And while in one sense you could say we’ve been “homeschooling” all along since our first child was born, it has only been this past year—when my oldest turned five—that we have “officially” begun to get our feet wet with more intentional schooling. Having looked forward to teaching my children at home for many years, I felt quite confident and had certain high expectations. Below, I reveal how it all has panned out. Homeschooling is both easy and hard. It is both delightfully fun and, at times, painfully stressful. It seems it is like any other worthwhile pursuit. It takes time. It takes work. Blood, sweat, and tears. And prayer—lots and lots of prayer. I knew it would be work, but now I know it is work! Daily discipline is probably the hardest thing. We don’t exactly at this point have our days perfectly laid out. I don’t even have our meals ready at the same time each day (working on that)! But this work is worth it, and I know the discipline will come in time, with practice. That’s essentially what discipline is, isn’t it? Practicing the right things over and over and over. Training (myself, in this case) to do what is right and to do it at the appropriate time. I’m learning right along with my kids. 1) Lesson planning takes a lot of work! I only had to plan five 45-minute classes—and they were spread out with at least a week between each one—but it was still a lot of work! I’m sure it gets easier to find a rhythm once you’ve done the same class for more than one year and have already done much of the preliminary planning, but I now have a small taste of just what goes into preparing for a class (minus any regulatory paperwork—you have my deepest sympathy, there). 3) Maintaining discipline and order in the classroom is extremely challenging. I’m not sure if the fact that these were young homeschooled kids made this aspect more or less difficult. 4) Maintaining the interest and attention of students, especially when each one may be at a different level of development or understanding, is quite difficult. 5) It is truly a delight when you hear from parents that a kid loved your class, has been practicing what he’s learned, thinks you’re the best teacher ever, and can’t wait for the next class! Yeah, so that one isn’t a negative. That’s what every teacher wants to hear! And it makes those moments when you want to pull your hair out worth it. Whether it’s in a public, private, or co-op classroom, consider this my hat tip to you, my teacher friends. Sometimes my personality and preferences will clash with what my child needs. I was excited at first about the math curriculum we had chosen because it offered so much hands-on learning, which both my husband and I thought was important for forming a basic understanding of math and how it works. What I didn’t expect was the semi-scripted lessons telling me I had to cut this out, make copies of that, and grab a small pile of different manipulatives or stacks of cards each day to accompany our lessons. Nor did I foresee the fact that my desire for efficiency would struggle with the concept of doing something with manipulatives just for the sake of “experiencing” math. Yes, I get that the purpose is for the child to have a greater understanding, but is it really necessary for him to make nearly forty “hundreds cards” that he will only use once? Math is more than facts and rules. And it’s more fun this way. The goal, I have slowly come to realize, is to learn the concepts and the facts while simultaneously gaining a deep understanding and appreciation for them—and we’re even learning to do more mental math than I’m used to doing as an adult! So I now see the value in all the “extras” that fill up our lessons. It is an opportunity to die to myself in service to another. I’m not particularly patient, and I like to get from point A to point B in the shortest amount of time possible. So the lessons still sometimes annoy me. And while homeschooling certainly affords me the freedom to build or find a curriculum that works for both my teaching style and my child’s learning style (read: I don’t HAVE to stick with this curriculum! ), I am also responsible to do what I truly feel is best for my child, even if it means I have to swallow my pride, deny my own tendency toward laziness and high efficiency (the two go together, don’t they? ), and press on with a program that my child enjoys and which is indeed challenging him to think in new ways and make his own discoveries as he explores the world of mathematics. I can’t wait until we can switch over to Saxon 54 (our plan all along) and my boys can work independently on math in a more disciplined and traditional way, but what we’re doing now will give them a great grasp on the how and why of math, which I think will be a great foundation on which to build! The struggle is worth it. I can learn to adapt for their sakes. A little stick-to-it-iveness goes a long way. I started and stopped this particular math curriculum twice already (“trying” it the first two times involved one two-week stint in the beginning before giving up on part-whole circles, and another four-day “trial” five months later). This third time around, I’m motivated by the fact that if we’d just paused at part-whole circles, given it a week to be mastered, and then jumped right back in, we’d be on to the next grade-level by now. My attitude changes everything. I let on right away my disgust for the cheesy little kids songs used to teach some early math equations, how to write numbers, etc. For the record, I’m not a fan of most little kids’ music. I found that very quickly my children shared my sentiment, and we gave up on the songs. When the program introduced part-whole circles before introducing written math equations, I stiffened up, made a bewildered face, said, “What?! ?”, and then my son didn’t like them either (and probably lost any interest in trying to figure them out). And this is why we threw in the towel the first time. I think my attitude made all the difference in the world. Now, having reintroduced things a second and third time with a much better attitude, and having worked with my son to conquer part-whole circles (we did introduce equations first), he now comments on how much he loves part-whole circles (and now we all seem to love those cheesy math songs! Both my boys beg for me to put the cd on!). I set the tone. I can be the greatest help or the greatest hindrance to my child’s learning. Attitude is everything. What I assumed would be the easiest subject turned out to be the most difficult. I’m not done with that math curriculum yet! Can you see that math has been my Achilles’ heel this year? I sure didn’t expect that when I started the year with a child who loved math and seemed to be pretty good at it! But neither of us had done a formal curriculum, so we each had quite the learning curve. That boy still loves math and is indeed good at it, but I have had to learn that just because he’s got a good mind for it doesn’t mean he will pick everything up on the first try (or even the second). He’s only five for crying out loud! The process is still line upon line, precept upon precept, a little here, a little there. My prideful expectation that my son would be a supernatural wiz kid in math and always understand everything the first time I introduced it to him had to be slammed down. Not because my son is any dummy, but because I was being the dummy! Math has been the hardest subject for me, not for him, because it has been the thing that has most upset my expectations. Praise God for upsetting my expectations! Treating this as a practice year has been incredibly important for my sanity. My son’s birthday falls right on the cutoff date. He could have started kindergarten this year in the public schools, and if we were sending him there, we’d have signed the waiver to keep him home an extra year so that he’d be the oldest in his class rather than the youngest. So, that’s just what we did as homeschoolers—instead of filing an Intent to Homeschool form, we just filed our paperwork to waive kindergarten. But as far as I was concerned, we were starting kindergarten at home. So I jumped in with a great reading program, that math curriculum I have already loved on so much in this article, and a plan to read lots of good books together. While we’ve really had a successful year, and there was math learning going on in the five months after we initially dropped the curriculum (mostly learning and practicing addition and subtraction facts with dollar store workbooks—not a bad method, might I add), I still felt like I had cheated my son of so much more in math since I didn’t stick with the program. I wish I had just done it. Take a break where needed for extra practice, but then keep going. But I didn’t. And here we are starting up again in lesson twenty-something at the end of the school year. Never mind that it’s at an advanced kindergarten/traditional first grade level. Never mind that many kids would be starting kindergarten at five and half or nearly six years old—so the only reason I feel behind is because of where my son’s birthday falls relative to an arbitrary start date. I still felt like I was behind. Then Nathaniel and I discussed what we should do with the paperwork this year. I had already been treating my son as a kindergartener in our homeschool group, even though we waived kindergarten as far as the state was concerned. We could file our first Intent to Homeschool form this summer with a kindergarten designation or a first grade designation. Our homeschool group wanted us to give them the same designation. So I was torn. But as we discussed it and as I heard from another mom who has all her babies in either July or August, she just always signed them up as the lowest grade level that fit their age. That way, they could go at their own pace, as far ahead as they needed to be, but if they weren’t advanced or were even a little slow in some areas, they could also proceed at their own pace without undue pressure. So we made the decision then and there to declare our son as starting kindergarten next year. It’s such an arbitrary designation, really, but it has taken a huge weight off of my shoulders! Instead of feeling like I had to scrap any hopes of picking up where we left off with the math program because we were already too far behind, it freed me to evaluate the situation in terms of: What do I really think would be the best course of action so that my son will really get it when it comes to math? What will give him the best foundation? Taking the pressure off of me to keep up with some mythical standard I had set up for myself allowed me to focus on my child and take that pressure off of him as well. What a beautifully freeing thing! How about you? What do you remember from your first year of homeschooling? And what lessons have you learned along the way since then? I’d love to hear from you!